In this Ruh Kaan Build Guide, we provide an overview of his strengths, abilities, Battlerites and matchups. Ruh Kaan is unquestionably one of the strongest Champions in Battlerite. Not only does he have incredible self-sustain when he Curses an opponent, but he also has a kit that offers exceptional ranged poke, a valuable i-frame in Sinister Strike and some mobility thanks to Nether Void. Ruh Kaan was awoken when a grave robber desecrated the sacred crypts of Ark'dun. Pursuing the trespasser led him to the Arenas where he is still tracking his quarry. He wields his dark powers to remove those who would stand in his way, taking great pleasure in consuming their souls. What makes Ruh Kaan incredibly powerful is the fact there are few, if any Champions, that can “trade” with him. His life-steal every time he Curses an enemy ensures that as long as he’s in melee range, he can obtain at least 30 health across 3 seconds. While that doesn’t sound a lot, it’s more than enough to mitigate incoming damage against most melee Champions. If he combines this self-sustain with his pull (Claw of the Wicked) and his shield (Consume) he can comfortably keep an opponent next to him, while ensuring Curse is maintained. Although Ruh Kaan is powerful, he still needs a skilled handler. Failure to land Shadowbolt, or miss-timing of his Sinister Strike can leave him particularly vulnerable as his only form of defence is then Nether Void (which requires Focus) or a weapon charge to inflict curse. Unsurprisingly, due to the fact Ruh Kaan is heavily reliant on getting enemy Champions close to him, he can be poked down by mobile ranged opponents such as Ezmo. Defiled Blade (LMB) - Ruh Kaan’s basic attack acts similarly to Sirius’, in the sense that it has a “charge”. Once the blade is charged, it allows Ruh Kaan to inflict Curse, a debuff that allows him to heal himself every time he strikes the afflicted Champion. The bonus damage of a charged Defiled Blade, combined with its burst of healing (and subsequent heals from continued attacks) allows Ruh Kaan to burst, and survive all at the same time. 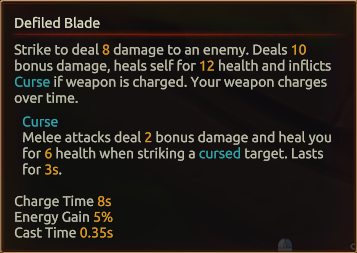 Ideally, you want to always engage with a charged Defiled Blade for maximum impact, especially when coupled with Claw of the Wicked > Defiled Blade > Shadowbolt/Sinister Strike. Shadowbolt (RMB) - One of the strongest ranged abilities in the game, Shadowbolt has a ridiculous range. Although its wind-up time is fairly long, and it’s predictable because of it, if you can successfully land Shadowbolt, you can instantly lop off a large amount of health. Shadowbolt is exceptional for poking, stealing Orb and generally bombarding the enemy when needed. If you can, try to bait the enemy team by cancelling Shadowbolt (“C”) and then relaunching it when your opponent has used a defensive ability. It doesn’t always work, but when it does, it affords free damage. Sinister Strike (Space) - Acting as an i-frame and making Ruh Kaan invulnerable when he spins forward, Sinister Strike is as much a defensive ability as it is offensive. Part of the challenge with Ruh Kaan is determining when to use Sinister Strike aggressively, or defensively. With it dealing 16 damage on impact, and often allowing Ruh Kaan to follow up with a charged Defiled Blade, it does afford Ruh Kaan mobile burst. Unfortunately for Ruh Kaan, if Sinister Strike is on cooldown, he relies solely on Consume to survive (especially if he lacks the focus to use Nether Void). If you can, only go on the offensive with Sinister Strike if you’re sure you can survive diving in. Consume (Q) - Allowing Ruh Kaan to negate all melee and projectile attacks, Consume also inflicts a snare, charges your weapon when you mitigate an attack and resets the cooldown of Shadowbolt. It’s fairly ridiculous the amount that Consume does, and there’s little wonder it’s a corner-stone of his kit because of it. When under pressure, it buys you signficant time and once you trigger an instant charge of Defiled Blade, you can then burst, Curse, and sustain yourself against your opponent. It’s also worth ensuring that you’ve used Shadowblast before you kick-up Consume so that you instantly gain another. Be sure not to waste Consume as if you do, you’ve only Sinister Strike to escape - especially if you’ve some time to wait for your weapon charge. Claw of the Wicked (E) - Ruh Kaan is very easy to kite, especially considering his only real mobility is Sinister Strike, a one-Focus Nether Void (which is predictable). Claw of the Wicked allows him to pull a single enemy towards him, while inflicting minor damage. If you have a charged Defiled Blade, the combination affords Ruh Kaan considerable burst and displaces a Champion from an assumed safe location. Ideally you want to always pull a high value target (such as a Support), but the burst potential is exceptional versus just about anyone. Unsurprisingly, if you miss Claw of the Wicked, it’s sometimes best to poke with Shadowbolt and wait for it to recharge to buy you a second opportunity to pull a player. Nether Void (R) - Allowing Ruh Kaan to effectively teleport to a targeted location, anyone in his telegraph upon appearing is inflicted by Curse. Nether Void is Ruh Kaan’s only guaranteed means of escape, and despite it causing Curse, there isn’t an automatic need to use it aggressively. In most instances, reliance on Nether Void is when Sinister Strike and Consume are on cooldown. If you do choose to dive with Nether Void, it’s best used so that you appear behind an opponent to immediately land some basic attacks. Should you need to, you can then Sinister Strike through them to create space and move away. Reaping Scythe (Shift + Space) - Acting as a non-physical attack, Reaping Scythe allows Ruh Kaan to not only siphon health, but also deal it at the same time. While he can be interrupted during his spin, Reaping Scythe is an incredible ability for draining health, but also damaging a Champion that’s using a counter. As it doesn’t trigger any counter, it’s fantastic against Champions such as Varesh and Shifu as it still allows you to deal high damage while they’re stationary. Just be conscious of the fact that when you use the ability, you’re vulnerable to ranged attacks and most players can avoid you if they’ve a mobility skill off cooldown. Claw of Undying (Shift + E) - As the only supportive ability available to Ruh kaan, Claw of Undying is best used when your team-mate finds themselves out of position, under pressure, or if their defensive abilities are off cooldown. The heal is significant, the pull invaluable (it gets just about anyone out of trouble) and its cast time is near instant. You won’t always use Claw of Undying, but it will save your team-mate’s life when needed. 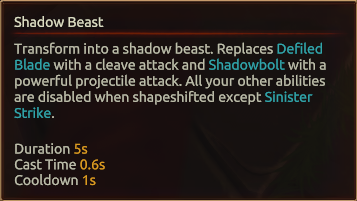 Shadow Beast (F) - Shadow Beast is easy to avoid for most Champions, simply because it has a clear “tell”. That said, if Ruh Kaan can manage to land his pull during his Ultimate, he can pummel enemies quickly for high, sustained damage. Shadow Beast is a monster at trading with enemy players as each basic attack heals Ruh Kaan for 16 health. The downside is that it can take several pulls with Shadow Claw to bring someone fully next to you. Ideally and to cut down on this pull time, it’s best to use Shadow Beast when immediately next to someone so you can instantly began to hit them. Be aware that you can still use Sinister Strike during Shadow Beast, allowing you to quickly leap at enemies when they’re near you. Like our Ruh Kaan build guide? You can help support its updates by subscribing to Ten Ton Hammer. Here's the details. Grim Edge allows Ruh Kaan to deal 5 bonus damage when his weapon is Charged. It doesn't sound a lot, but this can often be the difference between eating through a chunk of your opponent's health bar. The burst ensures Ruh Kaan can then pressure with ease. Shadowblast by default deals massive damage, but Agony increases this by additional 6 (to 36). While it’s a simple Battlerite, it allows Ruh Kaan to burst even more, and steal Orb with ease. When poking from afar, Agony allows Shadowblast to deal eye-watering damage that can pressure any player. Granting Ruh Kaan a second charge of Sinister Strike at a cost of 1 second additional cooldown, Demonic Hunt affords him mobility, utility and evasion. It also means he can play incredibly aggressive should he want to (two Sinister Strikes hurts!). Nether Chains allows Ruh Kaan to inflict Curse with Sinister Strike. When he's playing aggressively, this allows him to dive onto an enemy Champion and gaurentee life steal when he hits them. It also means that with with Demonic Hunt (above) he gets double doses of Curse when using Sinister Strike back to back. Perhaps the more aggressive option available to Ruh Kaan, Death’s Embrace allows him to root an opponent for 1.2 seconds when he pulls them. Combined with a charged Defiled Blade, which also now silences, it buys Ruh Kaan significant time to attack his chosen player. Best of all, if your team-mate(s) dive in on your pull, anyone caught can take a huge amount of damage. These Hero Threat Levels (1 being lowest threat and 10 being highest threat) are to help you determine which enemy Heroes can give you a headache. For the Heroes listed here, take extra care as they're particularly dangerous for Ruh Kaan. Ashka: His ranged poke and utility, combined with his ability to escape your pull makes Ashka particularly annoying to fight. Ezmo: His speed, rapid attacks, ability to shield himself and his long ranged poke makes him a headache to catch. Freya: She's frustrating due to her shielding and ranged poke. She can also easily avoid Shadowbolt. This list of tips and tricks are just a handful of things we think will help your Ruh Kaan play. We'll continue to add to the list as required and if you have any tips you'd like to share, let us know in the comments below and we'll place them here. 1. Your charged weapon is signified by a green symbol. Ruh Kaan is strongest when he can trigger the effects of this charge (silence). 2. When you inflict Curse on an enemy, you then gain lifesteal against them. 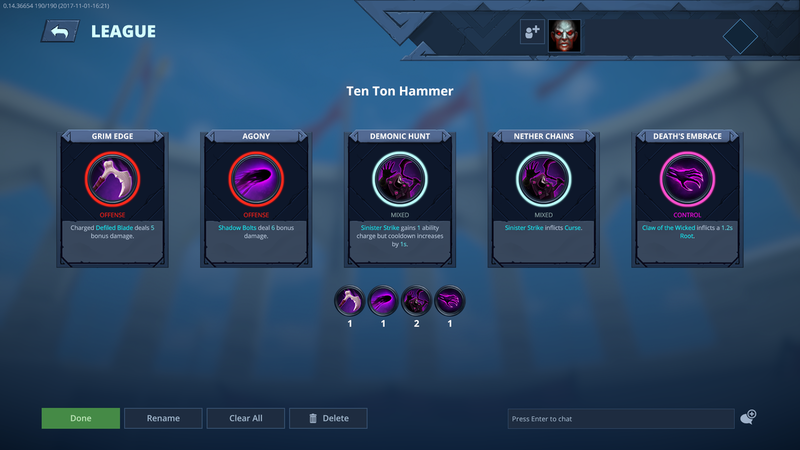 Use this time to heal up, and trade health versus them. Against most Champions, you'll always come out on top. 3. Don't be afraid to poke repeatedly with Shadowbolt. Its range is enormous and its damage huge: you don't have to rush in. 4. You can fake cast Shadowbolt by pressing C. You can sometimes force the enemy to waste an ability thinking they have to defend themselves. 5. Try to save Shadowbolt so it's ready when the Orb appears. At 35 health, you can steal the Orb every time. 6. 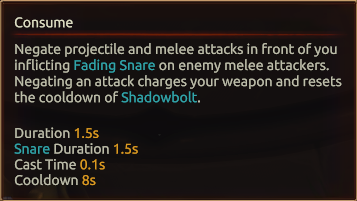 Consume doesn't just mitigate all attacks, but it also snares opponents who hit you, resets your weapon and Shadowbolt: it's pretty ridiculous. 7. 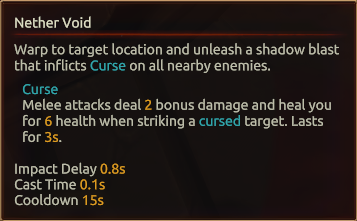 Consume has a long cooldown - only use it to buy yourself time or mitigate big attacks. 8. You can use Consume to body-block for an ally who's low health, or to negate incoming attacks made towards the Orb. 9. Claw of the Wicked is incredibly powerful as it pulls an opponent entirely out of position. Using your basic attack instantly, on a charged weapon, ensures they take gaurenteed damage. 10. You can pull the Orb with Claw of the Wicked to ensure your team secure it. 11. Nether Void is Ruh Kaan's only means of significant mobility. Save your Focus to use it to escape if you're out of cooldowns. 12. If you can, use Reaping Scythe against a Counter heavy composition: it doesn't trigger a counter effect. 13. Sinister Strike is an i-frame. That means it makes Ruh Kaan totally invulnerable to damage while travelling. Use this to nullify incoming or anticipated damage. Thanks for reading our Ruh Kaan build guide. You can help support its updates by subscribing to Ten Ton Hammer. Here's the details.